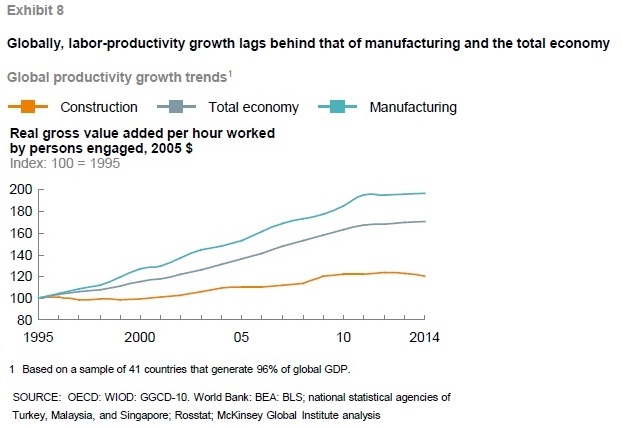 However, productivity growth in this sector has been sluggish, both in the US and around the world. Thus, a team of authors from the McKinsey Global Institute–Filipe Barbosa, Jonathan Woetzel, Jan Mischke, Maria Joao Ribeirinho, Mukund Sridhar, Matthew Parsons, Nick Bertram, and Stephanie Brown–has published “Reinventing construction through a productivity revolution” (February 2017). As a starting point, consider this figure. Each circle represents a country, and the size of the circle shows the size of the construction industry in that country. The horizontal axis shows the annual rate of productivity growth in construction from 1995-2015 in that country. 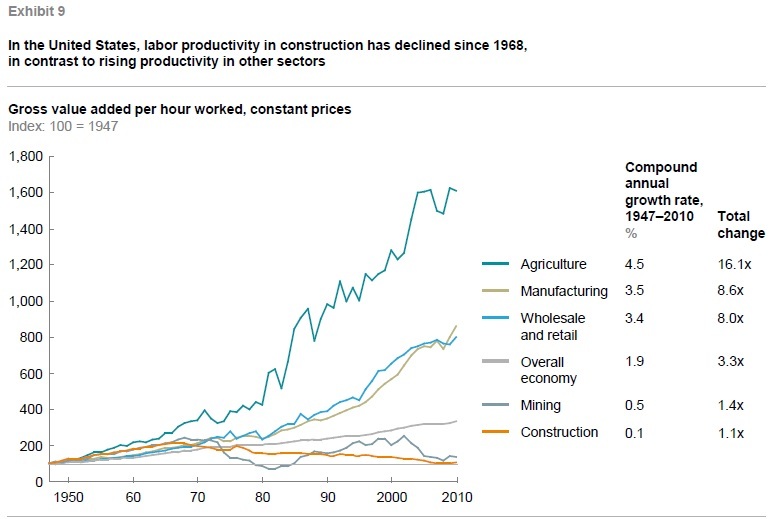 The vertical line at 0% shows that the US construction industry, along with a number of others, has experienced negative productivity growth in the last two decades. 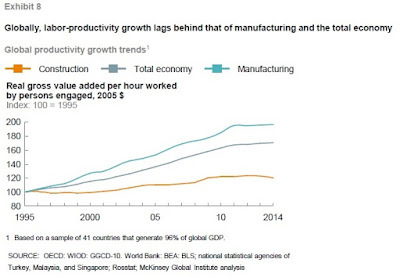 The vertical axis shows output/hour in 2015, a standard measure of productivity. It’s expected that high income countries like the US will tend to be relatively high in productivity: after all, that’s why they are high-income countries in the first place. The countries in yellow are the few examples of nations where labor productivity in construction exceeds labor productivity in the country as a whole. 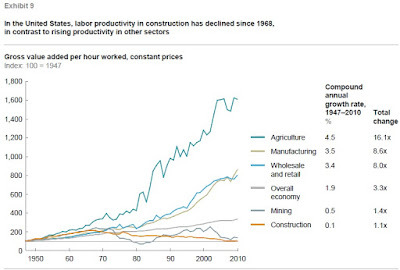 Here’s a figure showing how productivity growth in US construction lags that of other US industries. And here’s a figure showing how global productivity growth in construction lags the average growth in labor productivity across all sectors.